Learn what's happening during each week of pregnancy with tips and information you can trust customized to your estimated due date. Pregnancy can be such an exciting time, and Lamaze is here to support you on the journey! Click on each week below to show or hide the short preview. You're in week 6 of your pregnancy! "Ready or not, here I come!" If your little one could speak to you right now, he or she might just pipe up with this familiar childhood phrase. You may have eagerly awaited this pregnancy for months, or the news may have come as a surprise. No matter how you arrived, here you are, at the start of an unforgettable journey with this tiny little life. Take this time to nourish your body and your baby and prepare for each new day of pregnancy, childbirth and parenting. Lamaze seeks to serve you as a guide and a resource, and we'll be with you every step of the way. Look out for a newsletter from us each week with information and inspiration that will guide you through your pregnancy and birth experience. We invite you to read on, ask questions and enjoy! You're in week 7 of your pregnancy! Are you having a hard time keeping food down lately? Many women experience nausea in the first trimester—but luckily, the feeling usually passes by the start of the second trimester. If you’re not able to eat much right now, be sure that you make every bite count. Read more on how to nourish your body. You're in week 8 of your pregnancy! Are you worrying about something that you put in your body before you knew you were pregnant? The long list of “pregnancy don’ts” isn’t meant to scare expectant mothers. Instead, it’s geared toward helping you make healthy decisions from the moment you discover you are pregnant and on. Don’t stress too much about that celebratory drink you had before you knew you were pregnant. Now that you know that you’re carrying a precious little one, use this time to focus on making healthy choices for yourself and your baby. You're in week 9 of your pregnancy! Choosing a caregiver and choosing a birth setting (the two usually go hand in hand) are two of the most important decisions you’ll make while you’re pregnant. They can influence the path of your pregnancy, birth and early mothering. You may not realize all of the options you have. If you don’t have any health concerns, you can select either a midwife or a physician to provide your care. 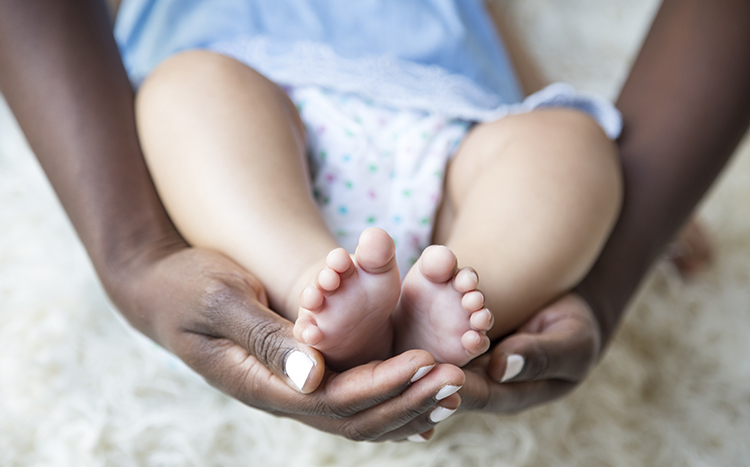 If you choose a midwife, you may consider birthing in a hospital, a birth center or at home. If you choose a physician, you will most likely birth your baby in a hospital. Start by reviewing the truths of childbirth to help you make informed decisions regarding your caregiver and birth setting. You're in week 10 of your pregnancy! There must be a good reason why so many doctors require routine ultrasounds during pregnancy...why so many labors are induced...why women with a previous cesarean surgery must have another cesarean. It’s for the safety of the baby, right? Not necessarily. This week, you’ll explore the basics of informed decision making, and discover how you can apply it to the choices you’re presented with during pregnancy and childbirth. You're in week 11 of your pregnancy! In Western culture, moms receive most of the attention during pregnancy. It’s easy for dads to feel left out and insignificant. Yet fathers-to-be have emotional needs, too, and can be involved in parenting right from the start. Share these tips with the father-to-be to ensure that he’s cared for during your pregnancy and feels prepared and excited for his new role. You're in week 12 of your pregnancy! As you begin to share the news of your pregnancy, and later as your belly grows, you may notice that people—even perfect strangers—want to share their “words of wisdom” with you. After your baby’s birth, the advice will keep coming. Everyone has an opinion about where and how to give birth, how to soothe a crying baby, where your baby should sleep—the list goes on and on. Some of this advice may contradict what you already know or believe. Much of it will be advice that you did not ask for. How do you handle all of the “well-wishers?” Discover how to sort through the information you’re receiving and seek out reliable advice that fits what you believe about pregnancy and birth. You're in week 13 of your pregnancy! Friends, family, or even complete strangers may tell you not to exercise while you’re pregnant for fear that you will harm the baby or go into labor too soon. However, years of research show that exercise is safe and beneficial for most pregnant women. Remember that in about 27 weeks or so, you will be performing an enormous physical feat—childbirth! Prepare your body and mind for the challenge by engaging in moderate physical activity on a regular basis. You're in week 14 of your pregnancy! We all need and value our friends. They share our thoughts, our concerns and our challenges. They provide support in times of need. And, they can be just plain fun to be around. Feel supported in your decisions by connecting with other moms-to-be who share your birth vision. You will learn and grow with these other mothers through your shared experiences. Draw additional support from a birth team that you trust. Be sure to surround yourself with people that you can count on before, during and after the birth. You're in week 15 of your pregnancy! We’ve all heard about the importance of eating well in pregnancy. Women need more protein, more iron, more calcium, more calories, more, more, more…it’s easy to feel overwhelmed! Simplify your approach by focusing on quality, not quantity. Aim to incorporate a few nutrient-dense “power foods” into your diet each day. Take a look at some tasty, highly nutritious foods that you can incorporate into your diet. You're in week 16 of your pregnancy! As a mom-to-be, you have many opportunities to get in touch with your baby during these nine months of pregnancy. Within the next few weeks, you may begin to feel those tell-tale flutters that mean your baby is merrily dancing away. As your baby’s senses develop, you may be able to feel your baby reacting to sounds, lights and touch. You can sense your baby’s periods of rest and activity, and even be able to tell when your little one is having hiccups! Your intimate connection to your baby allows you to get in touch with your baby in ways that others simply cannot. Take time to celebrate these moments, as they are the foundation of a strong lifelong relationship. You're in week 17 of your pregnancy! For some women, weight gain during the second trimester is not so fun. The second trimester can be seen as an awkward ‘in between’ stage, when you have noticeably gained weight but may not look obviously pregnant just yet. Know that your body, in all its wisdom, is doing exactly what it needs to be doing for your little one. The weight gain you are experiencing is necessary to support life during pregnancy and breastfeeding. Learn more about just where all the weight goes during pregnancy from Health Canada’s Healthy Weight Gain during Pregnancy. You're in week 18 of your pregnancy! You're in week 19 of your pregnancy! It’s been a long time since Lamaze was all about breathing. But, relaxation and focusing on breathing continue to be effective ways of decreasing stress and tension. They break the fear-tension-pain cycle, when stress and fear make woman tense her body, which increases pain, which then increases stress and so on. In labor, relaxation and conscious breathing can break this cycle and decrease how much pain you feel. This is especially true if you use them with other comfort measures for labor, like movement, massage and water therapy. Relaxation and conscious breathing can also help in day-to-day stress management before and after baby arrives. This week, we’ll explore ways to relax and reduce tension. You're in week 20 of your pregnancy! Pregnancy and birth are normal processes for a woman’s body. Our bodies are designed to grow, birth and nourish babies. Like other involuntary processes, we cannot consciously control pregnancy and birth unless we physically intervene. Did you need to learn how to make your heart beat? How to breathe? How to digest your food? How to produce hormones? No, you didn’t need to learn how to do any of these. You don’t have to do anything to make these processes work. You can support them, or you can intervene, but they will happen all on their own. You can trust them. Trust your body. Trust yourself. Listen to the voice inside you that says you know how to grow this baby, how to bring forth this child, how to nourish your baby. You know how to be a mother. You're in week 21 of your pregnancy! What is it about birth shows that make pregnant women love to watch them? Like other reality shows, they depict only part of the reality. These glimpses of actual births are carefully edited to create exciting scenes that draw in viewers. Pregnant women, beware! Watching birth shows may prepare you for birth, but only if the births depicted are safe and healthy. Notice your response the next time you watch a birth show. Do you feel stressed about giving birth, or confident that you can achieve your ideal birth? Does the show provide inspiration, or does it frighten you? If you don’t feel good and confident while you’re watching the show, turn it off! Instead, surround yourself with positive images of childbirth that will help empower you to achieve a healthy birth. The Lamaze video Everyday Miracles: A Celebration of Birth is a great, encouraging example. You're in week 22 of your pregnancy! A baby means big changes to your daily routine. Although you are aware of this, any younger children or pets living with you are not. Take some time to prepare them now for the transitions ahead. Be sure to have a plan in place for introducing your baby to other family members. You're in week 23 of your pregnancy! You’re growing something amazing inside of you. This seems obvious--of course, you’re growing an amazing baby. It’s likely that you haven’t considered the fact that you’re growing something else that’s pretty phenomenal--your placenta. It has grown with your baby in the womb from the cells of the fertilized egg. Through the umbilical cord, it nourishes and protects your baby every day. Explore more about your amazing placenta. You're in week 24 of your pregnancy! Childbirth education classes can be empowering, informative, insightful and provide you with a network of other expectant parents and supportive educators. They can also be none of these things. It is important to find a class that matches your values, lifestyle and childbirth goals. Do some research and find out which options are available to you. Class schedules can range from a single afternoon to a ten week series, depending on who is offering them. This week, we’ll explore what to look for in a childbirth preparation class. You're in week 25 of your pregnancy! You're in week 26 of your pregnancy! Sleep, the elusive pleasure that many a pregnant woman and new mothers yearn for. You likely feel more tired in the later weeks of pregnancy, and a lack of sleep may be to blame. The signals you’re getting from your body are nature’s way of preparing you for early motherhood. As you adjust to the increased demands on your energy, consider how the hours of your days (and nights) might change in the months and years ahead. This week, we’ll explore the topic of sleep. You're in week 27 of your pregnancy! You're in week 28 of your pregnancy! You’ve entered the home stretch! The third trimester is a time of growing anticipation. Your blossoming belly and all those kicks and hiccups are a constant reminder of the little life inside you, who is awaiting the chance to meet you face-to-face. Be kind to yourself and your baby at this time. You’ll have to modify your exercise routine slightly to keep things comfortable and safe. It’s also a good idea to ensure you are getting proper nutrition, as baby’s nutritional needs peak during these next few months. This week, we’ll explore the third trimester and the changes it can bring. You're in week 29 of your pregnancy! This week, we’ll explore healthy birth practice #1: Let labor begin on its own. You're in week 30 of your pregnancy! Ask women who have given birth naturally what helped them ease the pain of labor, and many will say it was the ability to move around and change positions. Movement in labor can help your baby find the best fit through the birth canal and reduce your perception of pain, among other benefits. Be sure to remember an important step that will help you feel more comfortable during the birth: walk move and change positions in labor. You're in week 31 of your pregnancy! You're in week 32 of your pregnancy! Interventions are procedures or treatments done to find, prevent or fix problems. Certainly, some women need interventions in labor. But many hospitals and care providers have rules or tendencies that lead to routine intervention for all women, regardless of their risk or individual situations. Using interventions with women who are unlikely to benefit from them makes labor less safe and more difficult. This week, we’ll explore the fourth Lamaze healthy birth practice: Avoid unnecessary interventions. You're in week 33 of your pregnancy! You're in week 34 of your pregnancy! In the moments right after birth, babies go through an amazing and challenging transition. Inside the womb, they are kept at the perfect temperature and get everything they need through their umbilical cords. After birth, they must keep themselves warm, their lungs must shift to breathing air, and they must learn to suckle, swallow and digest their mother’s milk. Whether or not all these changes will happen safely and easily depends in large part on the care babies and mothers receive right after birth. This week, we’ll explore the sixth Lamaze healthy birth practice: Keep your baby with you. You're in week 35 of your pregnancy! These final weeks before birth are like the finishing touches for a big dance. The dance floor is ready--the past nine months of eating well, exercising, and resting have been a time of preparation. The musicians are practiced and gathered--mother and baby have been warming up for months, learning how to make the best music together. And at just the right time, when things are completely ready, the dance of labor and birth will begin, and the players who have been rehearsing for all these weeks will delight in seeing each other’s faces. Find out more about preparing for the big dance. You're in week 36 of your pregnancy! At 36 weeks, your little one is probably weighing in at about six pounds (2.7 kg) and has a pinker, chubbier appearance. She’s grown to nearly 20 inches long, about the length of a stalk of romaine lettuce. Other changes are happening inside your uterus as well. As your placenta ages, it allows larger substances to pass to your baby. Therefore, in these last few weeks, your little one is accumulating beneficial things that she could not get from a younger placenta, such as your antibodies. These antibodies will help protect your little one from infections in his early months. If you plan on breastfeeding, this passage of antibodies through your breast milk will continue for as long as you breastfeed. You're in week 37 of your pregnancy! Have you ever heard an old-forgotten song or smelled a familiar smell and found yourself thinking of a particular place or time? Stimulating your senses of touch, taste, sight, sound, and smell can be a powerful way to focus or distract your mind. Many women rely on this idea when seeking comfort in labor. Surrounding yourself with soothing music, sound, and touch can have a profound effect on the way your brain perceives pain during childbirth. Women who utilize techniques such as massage and water immersion report lower levels of pain during labor. This week, we’ll explore ways to stimulate your senses as a way to relieve labor pain. You're in week 38 of your pregnancy! Labor is an important job that only you can do. Your body knows how to give birth, and it can birth beautifully. Listen to your body, trust your instincts, and consider managing early labor at home where you feel safe and secure. Read more about staying confident in early labor. You're in week 39 of your pregnancy! During the last weeks of pregnancy, a series of physical changes sets the stage for your baby’s birth. The changes happen slowly and predictably, and each change is a vitally important event in the performance of labor and birth. Your baby is ready to be born. And your body knows this. Together, your body and your baby dance into motion. Explore the simple story of birth. You're in week 40 of your pregnancy! Nothing can describe the moments when you first gaze at your newborn’s face and the following hours when you marvel at everything your baby is and does. This time is more than a sequel to birth--it’s another part of the beautiful, unique dance between mother and child. These hours establish the foundation of your future together, allowing love, trust and understanding to grow. Explore what you may experience in the soon-to-come moment that you greet your baby. You're in week 41 of your pregnancy! You're in week 42 of your pregnancy! Congratulations! You and your baby experience pregnancy differently, yet here you are at the end of this journey together. As the adventure of pregnancy comes to an end, the birth of your baby begins yet another unforgettable journey together. It is important to still take time to nourish your body and your baby and prepare for the adventures of parenting. Continue to turn to Lamaze, as we have a whole host of resources for new parents. Once again, congratulations!